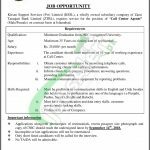 Tap this page for KSSL ZTBL Jobs 2018 Kissan Support Services Application Form Download. KSSL is the subsidiary of the Zarai Traqiati Bank Limited is looking for the dynamic, professional, energetic and caliber individuals to fill the vacant situation for the vacancy of (Call Center Agents) who have are having the interest and are well experienced and qualified according to the vacant situation and knows the all works and responsibilities of the Call Center Agents and are excellent to hold the job with full will and can accomplish all the onerous tasks with heart and devotion will be eligible to apply for such post. All those candidates whoa re in probe of such jobs so tap to the Josbalert.pk website in order to visit this website in order to remain updated all the time and can have all the job opportunities within a blink of an eye with complete information and details. So stay in touch with this website and aware also those who are far away from this website and are still unknown regarding it. Now have a look at its applying criteria and vacant position to give the full and final information about the listed job thoroughly. Interested candidates visit the website to applying purpose on www.kssl.ztbl.com.pk. Download the application form and submit it to Head HR Kissan Support Services Pvt. Limited, Room No. 1108 Main Building, ZTBL Head Office, 1-Faisal Avenue, Zero Point, Islamabad. Only eligible candidates will be hired for this job. The last date to apply is September 14, 2018. Last Date For Applying: September 14, 2018. Address: Head HR Kissan Support Services Pvt. Limited, Room No. 1108 Main Building, ZTBL Head Office, 1-Faisal Avenue, Zero Point, Islamabad.